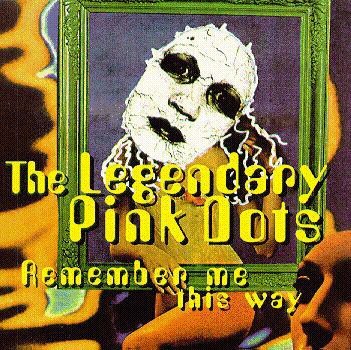 The Legendary Pink Dots, "Remember Me This Way"
Tracks 1, 4 and 5 mixed by Raymond and Martijn, and the remainder by Ryan and Edward. Limping Anastasia waits patient in the yard. For just one hint of recognition, two strong arms. And a ticket to America where everything is better. She can hide behide a curtain, write letters. Perhaps a handsome senator will take her by the glove, he'll face the people helpless - they will fall in love. Oh, they'll shower her with sympathy, they'll give her all their money. She will fly back home again with a private army. The bombs will decimate those towers, I'll be on my knees. I'll plead for her exquisite mercy, I'll lick her high heels clean. And I will sell my Judas friends for ten years in a hole. I will sell my family, I shall sell my soul. But remember her dark intentions: I'll just roll her chain. I'll slip a penny for the tram fare, I'll tell the driver, "Don't stop 'til Spain." The king will see no visitors this evening. He's resting in his bath. And he's restless for the screening of his favorite soap - this episode is crucial. The king just needs to cry. Far away, the peasants are revolting, the generals have been choked with knotted flags. I hear they're hanging from the balustrades. From mile-high-rises, microwaves are dropped. Drive-bys, dodge them all, to swarm into the hungry mob, to desecrate them, defecate them, no one's leading on. They keep pitching forwards, this way, that way, anyway. And I heard the airport's overflowing, and the borders have been closed. We are censoring this message, though we're sure that no one knows: No one cares! The king is looking rather disappointed. He's staring at the screen, and he's swearing, 'cos he's seen someone died. The funeral is live.